Per pale or and gules, dexter: a dimidiated eagle displayed issuant from the partition sable, crowned langued beaked membered and armed of the second; sinister: a key in pale upward contourné gold. Divided vertically into two equal parts, yellow (hoist) and red (fly). In the hoist, a black double-eagle with a red crown, beak, tongue, legs and claws, cut in half by the palar line. In the fly, a yellow upright key with its ward toward the fly. The eagle symbolises loftiness, justice and protection. The key symbolises ecclesiastical rule, treasuries, and responsibility. The arms of Geneva are actually two shields impaled: half the eagle of the Holy Roman Empire, and one of the two keys of St. Peter (the "keys of heaven"). Geneva is one of the oldest cities in Europe, having been a Celtic capital before its conquest by the Romans in 121 BC. With the advent of Christianity, Geneva became an important and powerful bishopric. St. Peter's Cathedral still dominates the city. After the fall of Rome, Geneva came first under Frankish control, then Burgundian, and finally the Holy Roman Empire from which the city-state gained sovereignty in 1124. Savoy made repeated attempts to annex the city until 1603 when Bern lifted the last siege. Bern and Fribourg had been allies of Geneva since 1519, and Zurich formed a perpetual alliance in 1584, but the Swiss Catholic cantons blocked Geneva's attempt to become a full-fledged member of the Confederation. France annexed Geneva in 1793, but it regained its independence in 1813 and became the 22nd member of the restored Swiss Confederation in 1815. 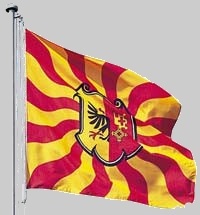 The flag of the old bishopric of Geneva consisted of two gold keys on a red field, the field colour symbolising sovereignty within the Holy Roman Empire ("Blutbanner"). The earliest known example dates from 1293. In the 15th century the imperial eagle was impaled with the keys (obscuring one key and half the eagle), thus demonstrating both the city's imperial freedom and the bishop's sovereignty. The full coat of arms of Geneva consists of the shield surmounted by a crest in the form of half a sun inscribed with the initials "J H S" (Jesus Hominum Salvator), and below a scrolled motto "Post Tenebras Lux" (after the darkness, light). The sun was an symbol of Geneva from earliest times, and the motto was added during the Reformation. The full coat of arms appeared as the central device on Geneva's flamed war flag of 1815. With the admission of Geneva in 1815, the modern Swiss Confederation assumed its current geographical shape, and remained at 22 cantons (not counting half-cantons) for the next 164 years. This version with the coat of arms over the cantonal/communal colors with a flamed arrangement like old military flags is still made today (see: http://www.kellerfahnen.ch/KundenUpload/KEFA/Bilder/Artikel/GGE150_a_b.jpg).